Two movies are being filmed in the Rio Grande Valley beginning Today, July 20, the Rio Grande Valley Film Commission announced recently. The films, "Going Hollywood" and "Los Scavengers," are hiring many cast and crew for the productions. "We have really worked hard to make sure that these films are shot here rather than in LA or in some other location," said Producer David Rice. "We want to help the Valley, and these films bring not only money into the economy, but also give locals experience in the film industry." The first film that will be produced, "Going Hollywood," has been cast. It will feature Mexican film star Fernando Carrillo and local television star Valente Rodriguez, most famous for his role as Ernie on The George Lopez Show. The second film, which will require a number of teenage actors as well as adults, will be cast in the near future. It will be directed by Rodriguez. The two films, while small budget productions, will nevertheless leave behind more than $300,000 in the local communities in about a six weeks. In addition, Rice explains, the films will open the door for more and larger productions to be filmed here. 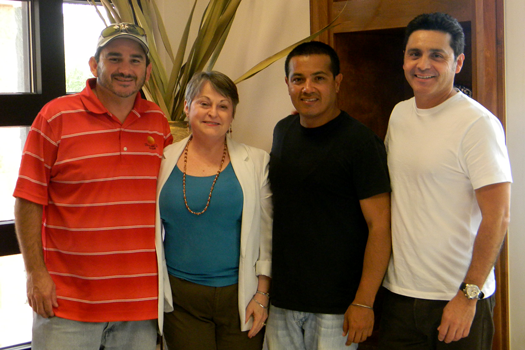 Photo Caption: From left, Valente Rodriguez, Actor & Producer; Nancy Millar, McAllen Chamber of Commerce and RGV Film Commission; Demetris Navarro, Director & Producer; David Rice, Writer & Producer.